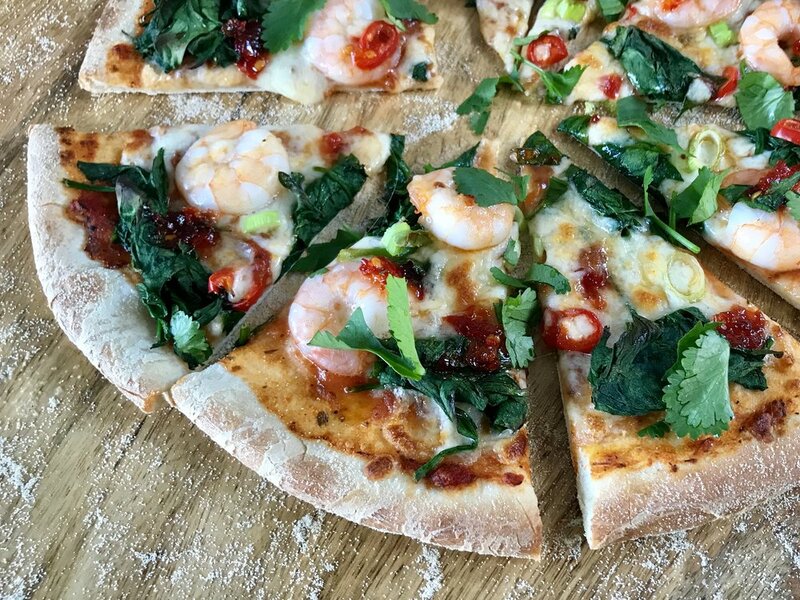 SWEET CHILLI JAM & KING PRAWN PIZZA WITH FRESH CORIANDER — NORTHERN DOUGH CO. If you’ve never baked fresh pizza at home, this sweet chilli prawn recipe is a great place to start. As delicious as any pizzeria, once you’ve tried this, you’ll be pushing the takeway menu straight back in the drawer and getting stuck into homemade pizza yourself. Pre-heat your oven to its hottest setting, and lightly flour your worksurface, rolling pin (if using) and baking tray. Roll or stretch your dough to approx. 10-12 inches in diameter (this will give you a classic Neapolitan style thin and crispy pizza. Fry the leeks in the butter for a few mins, until softened and leave to one side for a minute. Move your pizza base to the lightly floured baking tray, spread evenly with passata, then sprinkle with mozzarella and rest of the ingredients (dot the sweet chilli over the base in splodges) other than the coriander. Move to the hot oven for 8-10 mins, checking regularly towards the end of the cooking time. Your pizza will be cooked when the crust has turned golden brown and the toppings are bubbling. Remove from the oven and leave to cool for 3-5 mins. As well as preventing burnt mouths, this also helps the pizza topping to ‘set’ and means your toppings won’t slide when you slice into it! Slice, share (or not!) and enjoy!